Mark Twain once mentioned October as a peculiarly dangerous month to speculate in stocks. He wasn’t the most successful investor and actually spent his later years traveling the globe paying off debts he owed despite his book royalties and wife’s inheritance. He spent more than he made, like so many people today. Mr. Twain went on to mention the other dangerous months to invest his money of November, December, January, February, March, April, May, June, July, August and September. 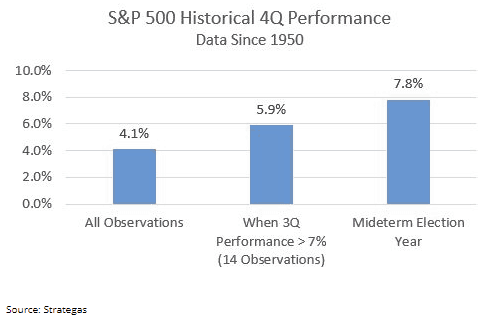 As bad as things seemed leading into the mid-terms, it’s worth noting the S&P 500 historical 4Q performance going back to 1950. November and December have historically been good months, with average returns of 4.1 percent in Q4. We see that when Q3 returned 7 percent or greater (14 out of 14 observations) the average Q4 return has been 5.9 percent. Note: we saw 7.2 percent in 2018 for those three months. Finally, as illustrated above, there is a 7.8 percent average return in mid-term election years during the last fiscal quarter. The S&P 500 has not declined in the 12 months following a mid-term election since 1946. I’m not saying there can’t be a first, but pointing out a fun fact. We’ll have to see what happens by November ’19. In the meantime we should keep a level head with our investments and avoid any kind of irrational behavior just because the markets are volatile. The Wall of Worry has been plentiful since the beginning of the year. Some of the issues on this wall are: anything Trump related, tax cuts for the rich, foreign policy rifts, yield curve flattening, inflation, correction/recession, re-negotiations of global trade agreements, Brexit/Grexit/Ital-leave, late stage Bull Market coming to an end, the confirmation of a Supreme Court Justice, high oil prices and then low oil prices, etc. The wall of worry. Two points about the continuous wall of worry. First, we are comforted that it exists and even more that it is being studied in respectful fashion. The time to really worry is when there is no wall of worry. Remember when the .com era was spitting out companies right and left and people were quitting their day job to cash in on day trading. No wall of worry. Or, how about in 2008 when Citigroup’s CEO, Chuck Prince, commented about originating and selling mortgages on the cusp of the housing crisis. The ladies locker room employee used to come to the golf shop and fill me in on how easy it was to get loan after loan on rental properties she would never be able to pay off simply by showing the bank some equity existed since last month. What a racket. Secondly, we do not see any of these current worry items spilling over into the fundamental economic or earnings data at present. Neither do we see them leaking into the confidence readings of key constituents in the economic and business world. 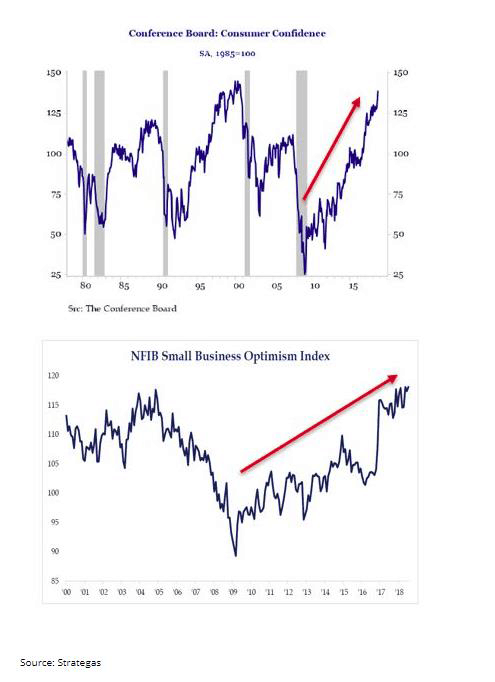 Confidence on the part of consumers, CEO’s, small business owners and employees appear to remain robust. 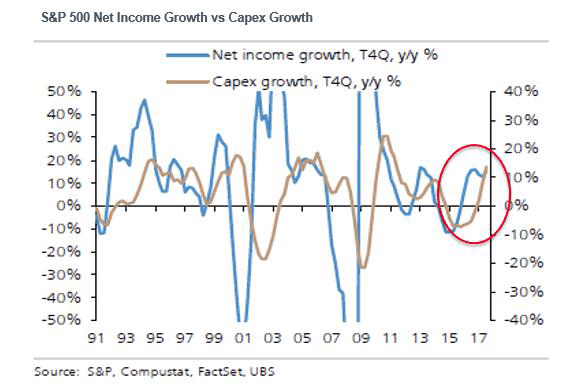 We see evidence of rising capital expenditures that are long overdue (chart above). This is the result of the strong confidence readings by CEO’s and small business owners planning with their capital, tax incentives to invest, and the estimated $700 billion in repatriation of foreign profits by U.S. companies. This is significant. It can drive productivity by workers and allow companies to increase wages without raising prices on their customers excessively and maintain profits…..a phenomenon that generates a virtuous cycle of rising demand and profits.